Hello dear friends! 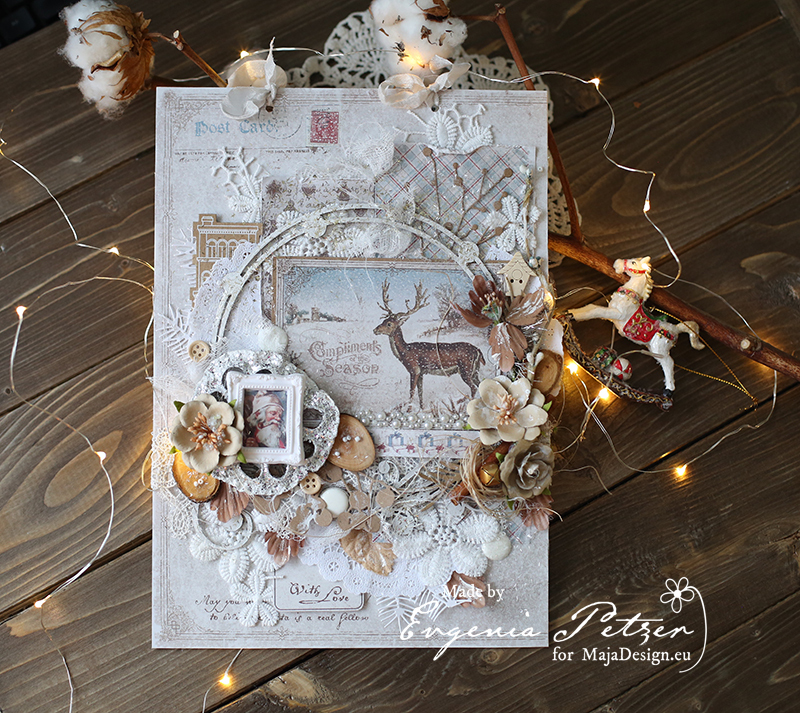 Its Evgenia Petzer with you today, I have prepared the wall hanging collage using the lovely Home for the Holidays collection. 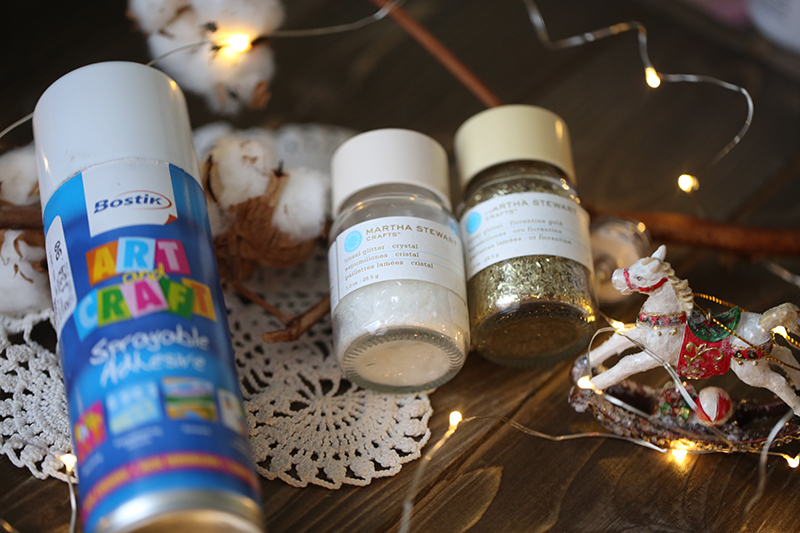 I love how this adhesive spray works – you just spray on the place that you need and sprinkle over with the glitter or other stuff that you need. Hello Maja Friends. The snowy weather is outside, it’s peaceful and beautiful, but I have already switched from the winter to the spring . 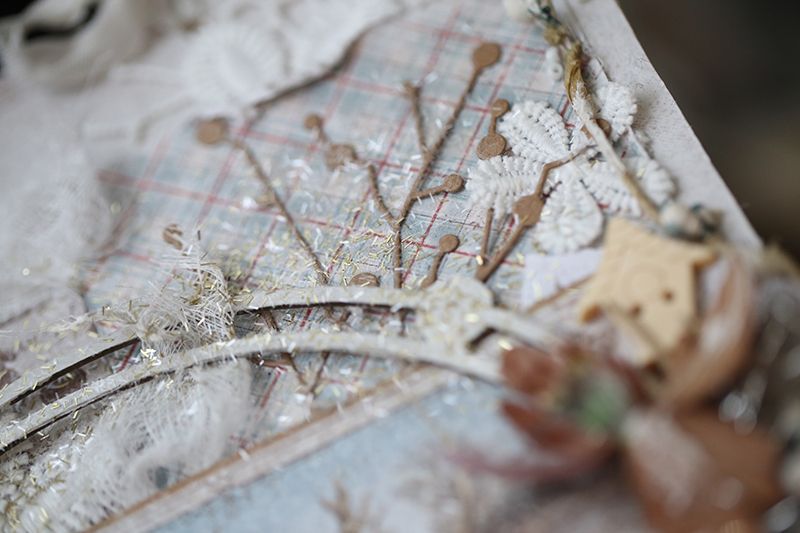 That is why many floral projects are in process at the moment. And today I am here to share with you a Floral Canvas I made. I used the photo for my canvas, that was made almost 4 years ago, but I still feel the smell of the gardens in bloom, amazing time really. 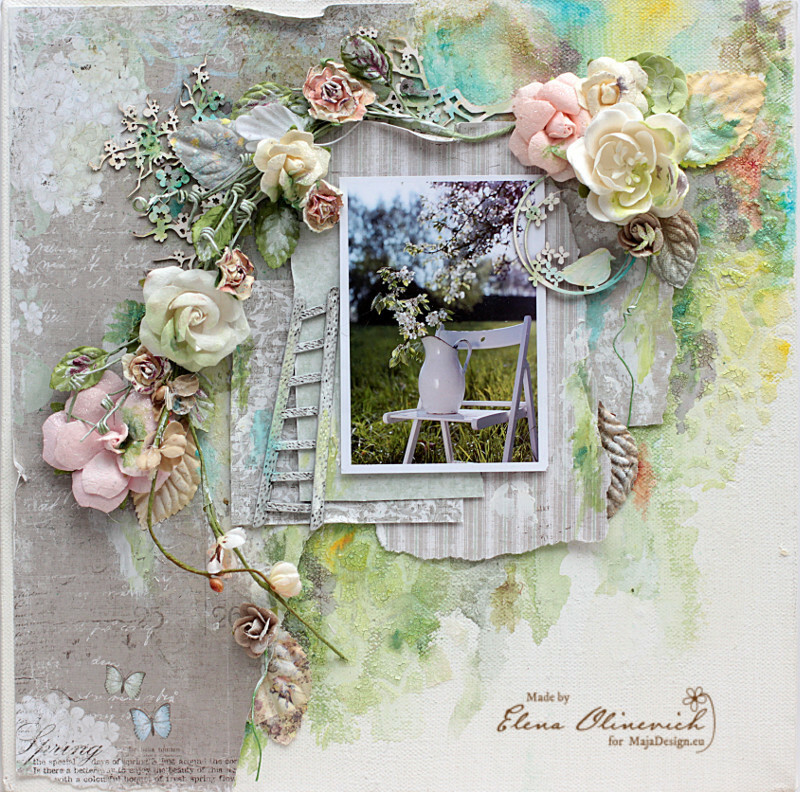 I also used Vintage Spring Basics Collection, so pretty. First, I wanted to keep the calm colors of the paper and add only the greens, but actually I enjoyed making the canvas background more bright than the papers and the picture are. The right thing was to keep purple and grey, but the necessity of adding the blues won that challenge. I am waiting for the days when we start live in the countryside and enjoy birdsinging in the garden. 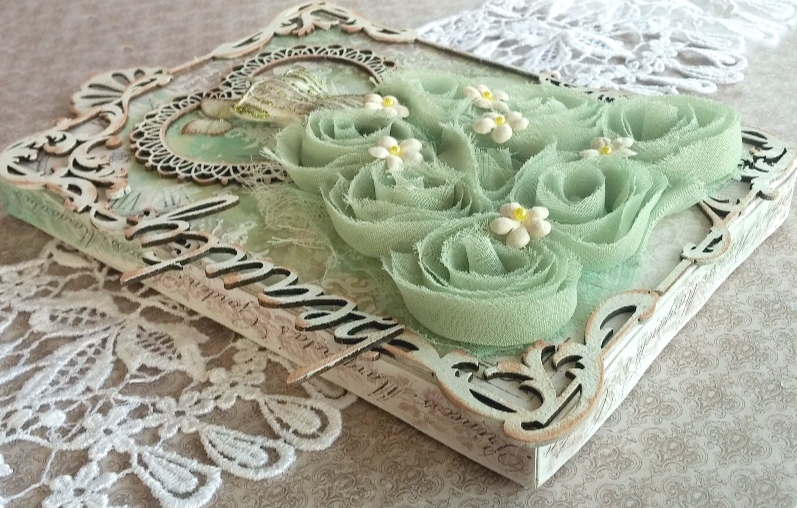 Vintage Spring Basics – 9th of March, 10th of March, 11th of March, Prima Marketing resin and flowers, Wycinanka chipboard. Hello Maja fans, Gabrielle here with you today to share a canvas I made recently. 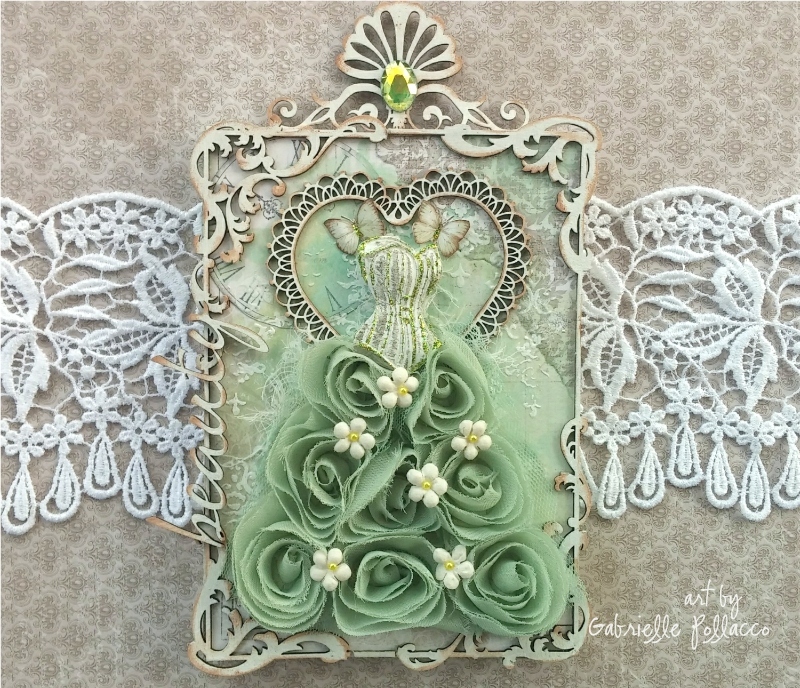 I had this cute soft green rose ribbon in my stash which made me think of those pretty couture gowns I sometimes see on Pinterest. 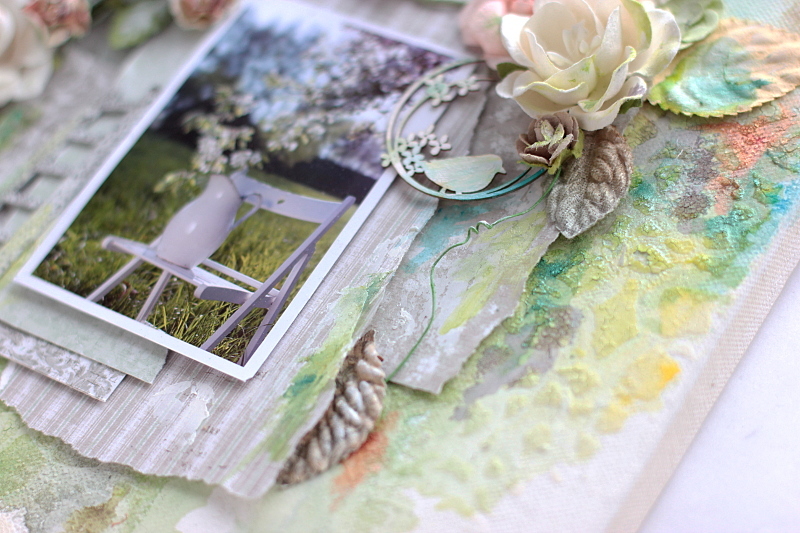 So I gathered some of my favorite Maja Design papers some Dusty Attic chipboard pieces and some Shimmerz Paints and got started. 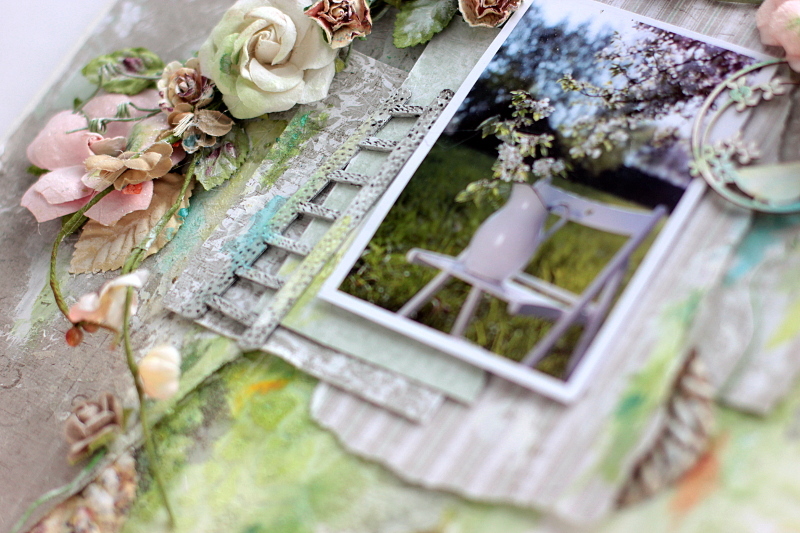 The majority of papers I used on this project came from the Vintage Spring Basics collection with a couple of papers from Crea Diem, Vintage Summer Basics and Sofiero collection. 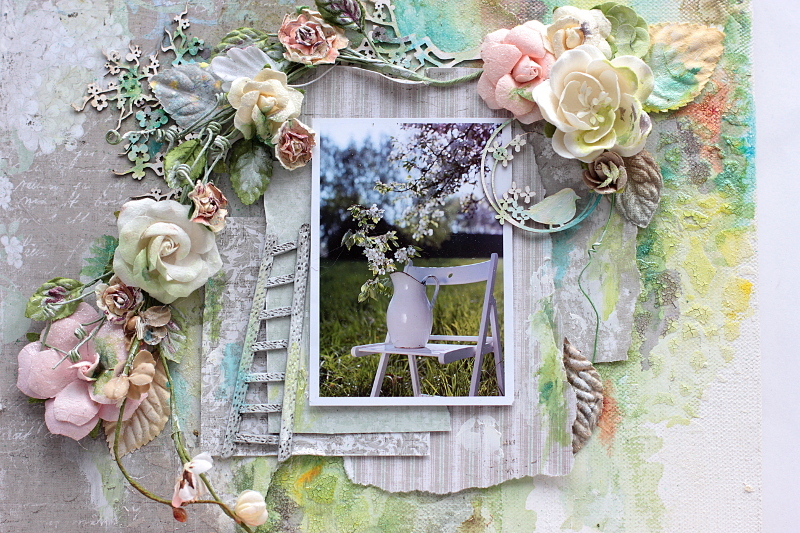 I used the following papers for this project: Vintage Spring Basics (1st of April, 6th of May), Crea Diem (Den oersättliga tiden), Vintage Summer Basics (1903), Sofiero (Princess Margareta’s Garden). I thought it would be fun to create a video tutorial to share with you all to show step by step how this little canvas was created….so grab your favorite beverage, take a little break and enjoy!…. I like to save all my title strips from my Maja Design papers for my projects and one of my favorite uses for them is to use as borders on my canvas’s. They are a perfect fit width-wise and for a 4×6″ canvas, they fit perfectly all around as well. 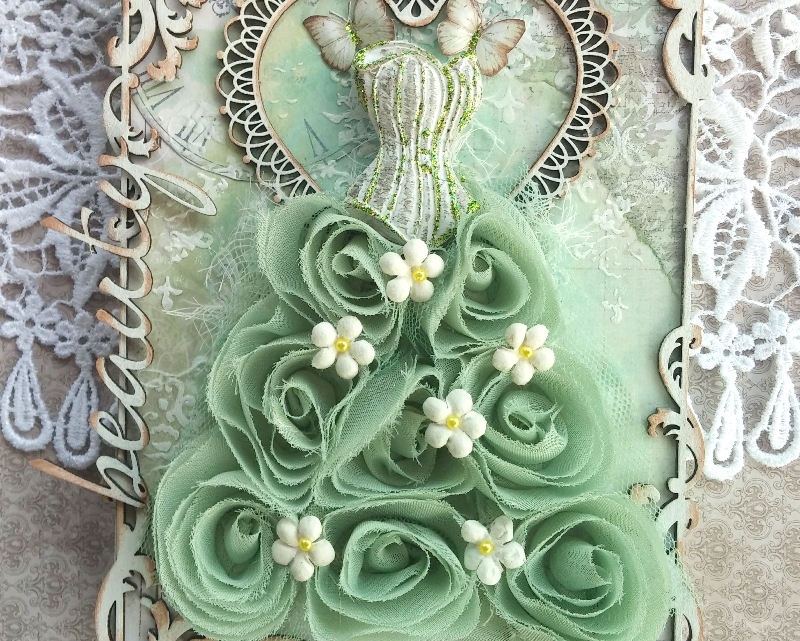 Here I used the paper strips from the Sofiero ‘Princess Margareta’s Garden’ paper for this (although you can use any border that suits your fancy for this. I found the perfect little frame for this in the Dusty Attic Baroque (Square) Frames ….using the smaller of the two frames in the set I just gave it a little snip here and there to make it fit my 6″x 4″ canvas. 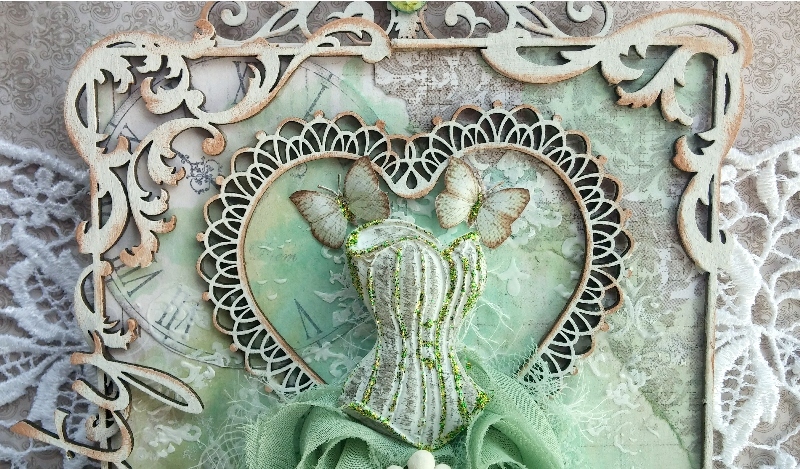 Prima’s Shabby Chic treasures had just the right size corset in it to suit my project. 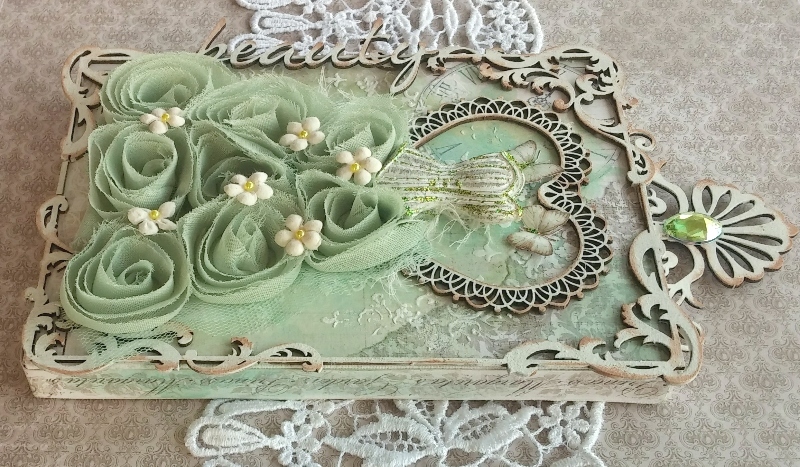 And then I found a lovely little heart frame in the Dusty Attic Lacey Heart Frames. 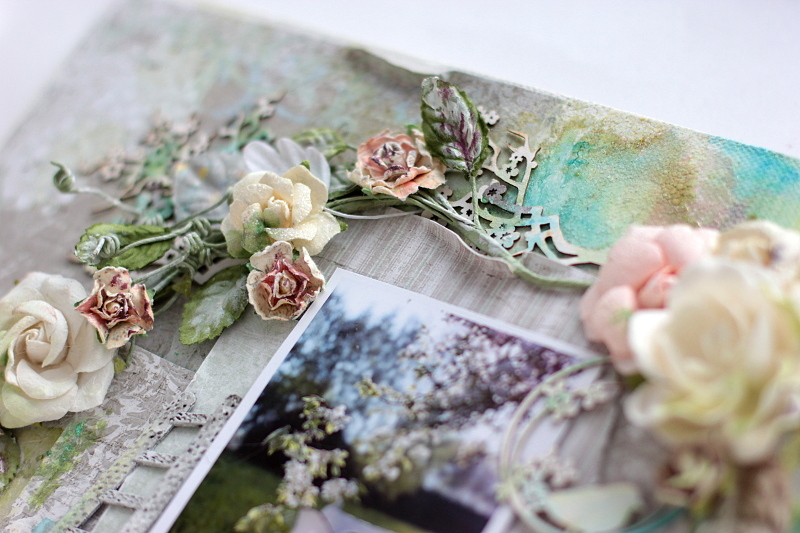 I chose my mixed media paint colors from the Kaisercraft rose ribbon a friend had sent me a little while back. I picked Shimmerz Paint’s ‘Ride the Tide’ and ‘Sage It Isn’t So’ Creameez to add a soft hint of color to the background of my design. I added a little texture with some texture paste and TCW’s ”Mini Brocade” 6 inch stencil. 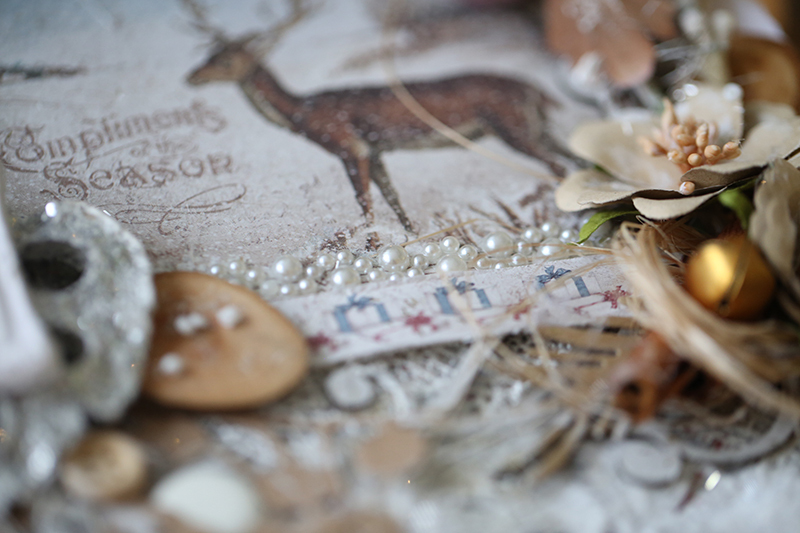 And finally I added a scripty title by using the chipboard word ‘Beauty’ from Dusty Attic’s Wordpack #20. We had just started a new Unit of Inquiry (UOI) as part of our PYP investigations. Our central idea was Different factors affect personal well-being. This unit was the way I would be able to make the authentic links to meet syllabus outcomes. I decided we would make a mixed media canvas and use the She Art style. The children would be able to personalise their She Art girl/boy and also learn new techniques. The learning intent for this project was to create a She Art girl/boy which reflected themselves. Their inspirational quote had to show positive personal well-being. Where to begin….when I walked into the classroom with the Maja Design box the children were jumping for joy! I had already made a sample canvas (as shown above) to demonstrate what we would be creating. We had a lot of planning to do. Sit back and enjoy a video of the all of the completed artworks and the creative process. After the children completed their canvases, they then completed a reflection. I have two to share which captures the process and their learning. When my class and I did She Art we learnt so many new tips and used so many tools. It was so much fun, we tuned the classroom upside down! We used mod podge, paint, bubble wrap, rub ons,stamps, gelatos, book paper, stencils, modelling paste and of course we got to use a canvas. We also chose our words. rubons, and some texture and much more. The canvases are proudly on display in our learning space (classroom) and we stop to admire them regularly. The parents have had a chance to look at their children’s work and were amazed at what their children have created. I am always amazed at how children are fearless when they approach art. They enjoy using mediums and love exploring new techniques. A big thank you to Jenny and Marie who offered the opportunity to my class and to Camilla for finalising the delivery of the papers. We still have a lot of papers to use…not sure what will come next but will share when we do! today I want to share with you a canvas, that I have made for my class sample that I taught last 12 months. I am working right now on some new samples, so I thought that I can post something made for the classes also. Well, I always tell to my students, that pink is not only for the girls. So I took a picture of my baby boy and worked with grey, coral and pink colors to create this canvas. 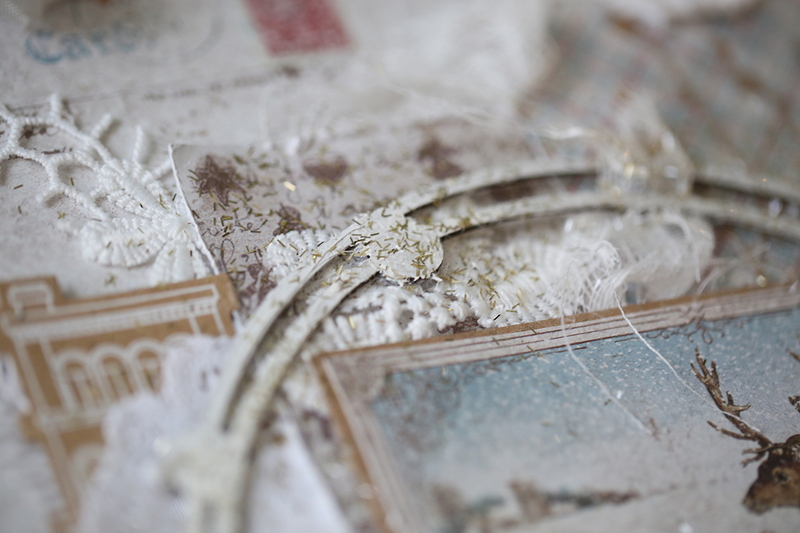 My choice was a very stylish Crea Diem collection, really a perfect match for any project. especially when you are adding some paints. 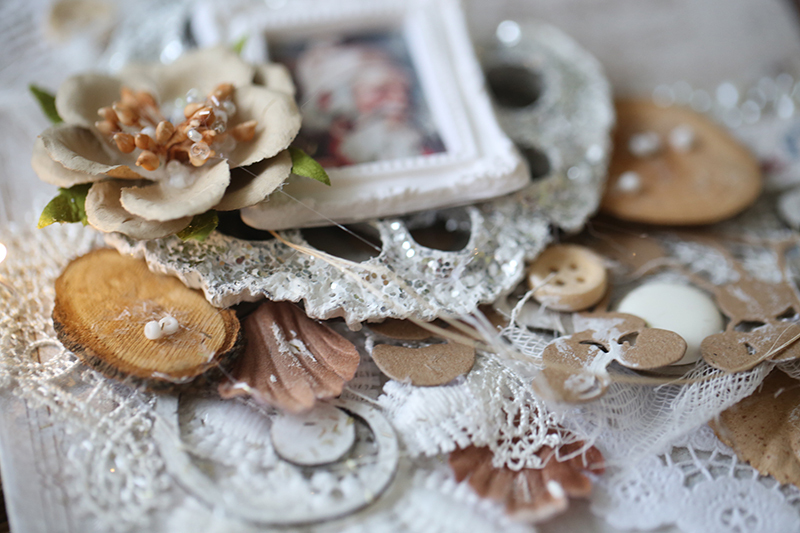 I used dome scraps from the Vintage Summer collection as they have some good expressions too. 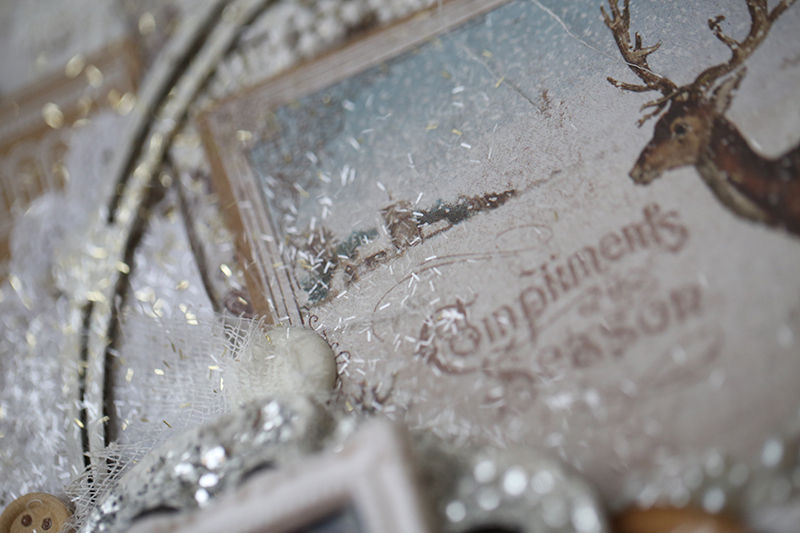 But the dots and script patterned papers are amazing for creating the layers. 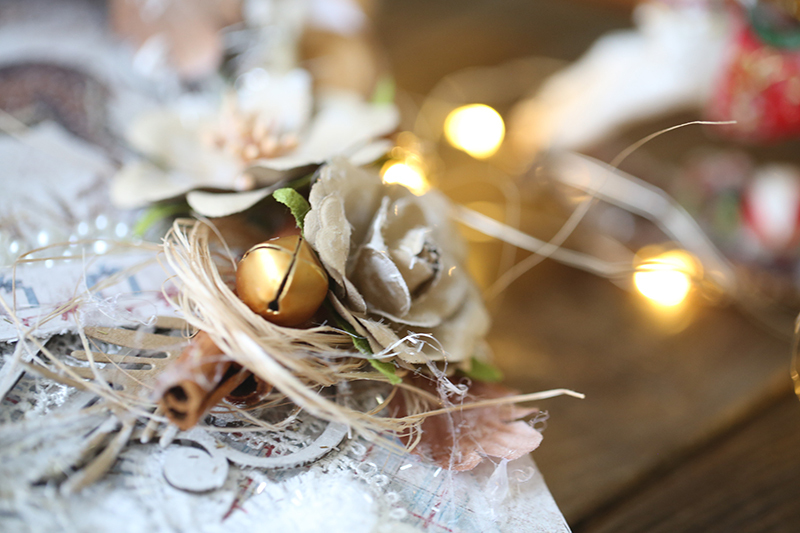 I want to thank all the ladies who visited my classes and I hope that you have enjoyed working with absolutely beautiful papers from Maja Design. Crea Diem Collection – Kärleken övervinner allt , Ord flyger bort , Den oersättliga tiden , Sann vänskap ; Prima Marketing sprays, stencil, stamps, flowers and trinkets, Canvas Stickers.